I love bringing out Ozobots for Hour of Code! There are so many things you can do with them – draw paths and codes on paper using markers and predetermined code combinations, make paths and insert codes using the Ozobot Draw app, and drag and drop programming with Ozoblockly. There’s something for all ages! Until I discovered OzoEasy sticker codes, asking kinder and 1st graders to draw their own codes was just a bit tricky. As I tell the students, Ozobot is like Goldilocks – every code has to be just right! Just as Goldilocks tasted the porridge and determined one was too hot, another was too cold, but one was just right, Ozobot likes those color combinations to be close to perfect! In fact, we even started calling the little robot “Ozolocks” when something didn’t go as expected! This year I gave each child a sheet printed off the Ozobot Educator’s page (can’t remember which lesson). It had a rectangular path printed with blank squares for coloring in the codes requiring three colors. I added additional lines in the inner part of the rectangle. For the little ones, I created a condensed version of the codes that was easier to read so they could choose a code for coloring each of the groups of squares. Each child also received 4 stickers. These were the “special moves” like tornado, backwalk, spin. They loved those! It was SO much fun watching the kindergartners interact with the Ozobots. The look of awe on their sweet faces was priceless! I wonder how many children requested these for Christmas! Here are short videos from each class of the students enjoying the Ozobots. What a hit! The students absolutely LOVE programming the tiny Ozobots! 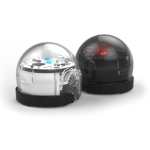 These are small robots that are programmable using color codes, the Ozobot app or the online Ozoblockly block-based program. What I love about these is that they can be adapted to several ages. One first grade class entered the room, immediately noticed the Ozobots on each table, and suddenly I heard, “Oh, Oh, Oh, we get to do Ozobots!” This little boy was practically dancing with excitement; even rushing over to give me a hug. 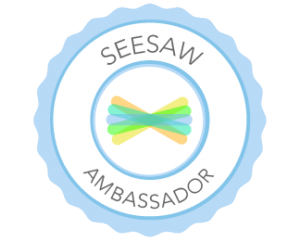 Some of the second, third, and fourth grade classes were asked to video their paths and codes to upload to Seesaw journals while explaining what Ozobots are and what they do. These fourth grade students did a fantastic job with their explanations. I see a future in sales! 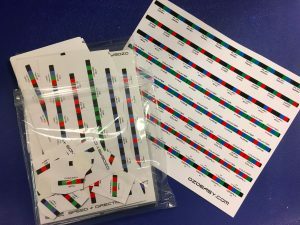 Ozobots are a fun and easy way to introduce computational thinking to children. It’s easy to adapt these robots to any age. What is an Ozobot? A tiny robot that can read specific color combinations that tell it to perform an action. 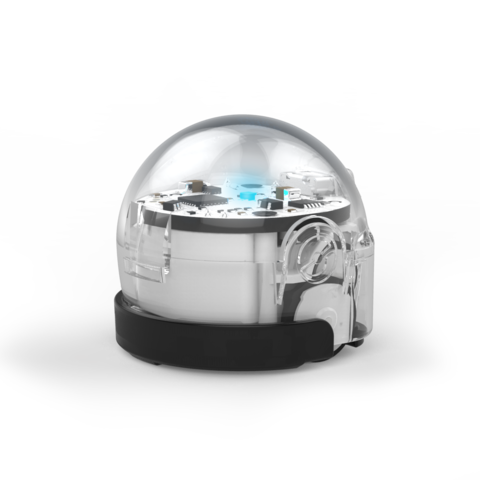 The Ozobot Bit is capable of downloading programs created with Ozoblockly (drag and drop interface). Did I mention these miniature robots are super fun?? 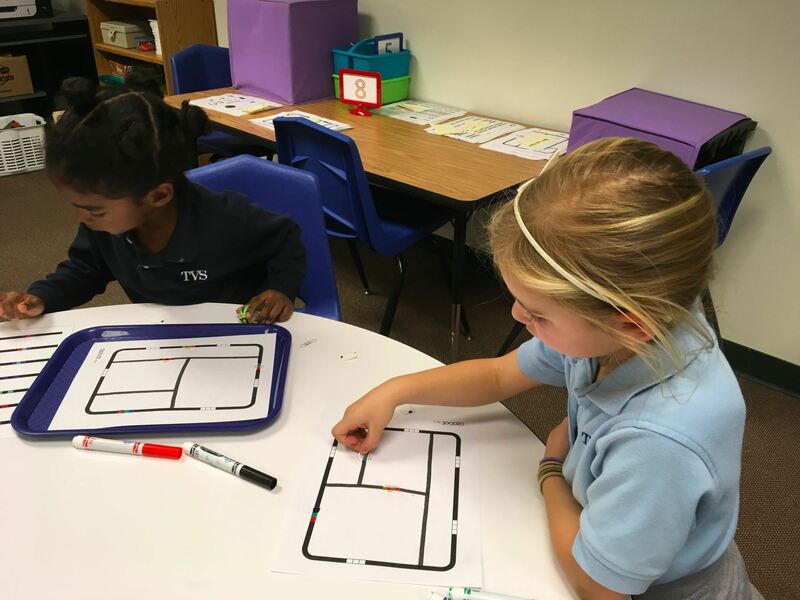 I wish I had a photo of the kindergartners faces when I first showed them how the Ozobot followed marker-drawn paths! Were they excited! 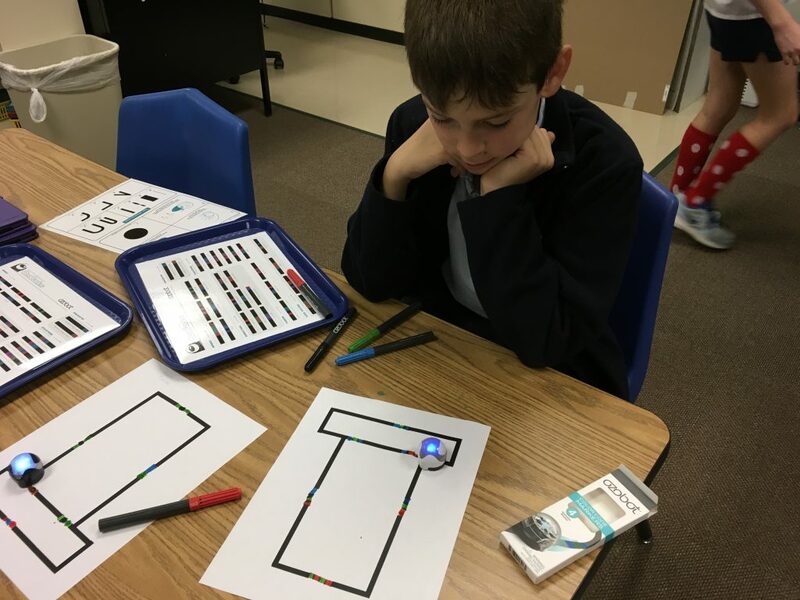 Knowing I wouldn’t be able to keep their attention for very long because they could not wait to get started, I quickly talked about how the Ozobot had a sensor that could read specific color combinations but that it was just a bit picky. Ozobot likes lines and color codes that are “just right” – not too thick and not too thin. We did a quick lesson on drawing a “just right” line, calibration, and even cleaning wheels. Then I told what they’d be exploring for the day. The Ozobot website has TONS of fantastic lessons and I chose the Mother’s Day Card. This type activity is perfect for the youngest users because all they have to do is use the key to color in the small squares (great fine motor practice!). For the first group, we were fortunate to have some fantastic fourth grade helpers. 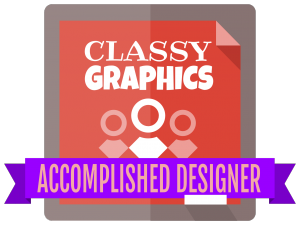 The next lesson segment was using Ozoeasy sticker codes. 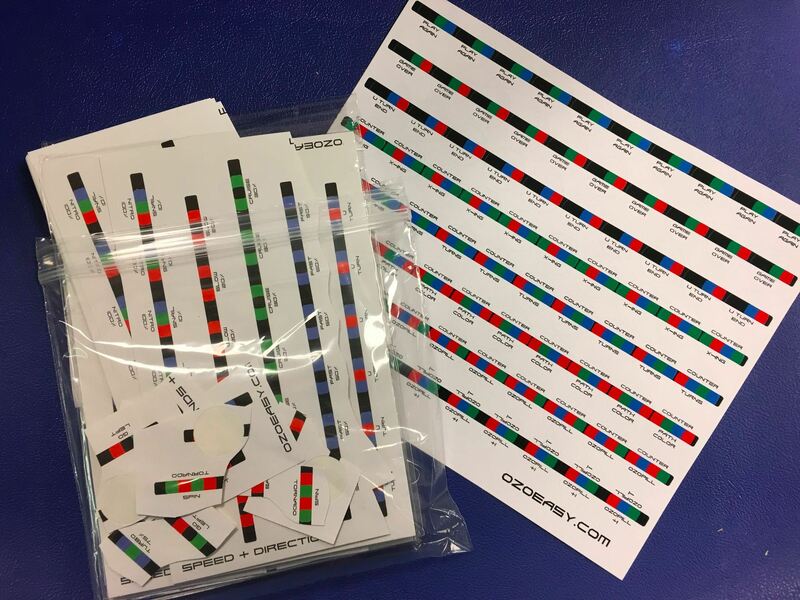 These are small, round stickers that have codes printed on them. This is fantastic for younger children because it really can be a bit tricky to draw a perfect code that the Ozobot can read. Even my 4th graders struggle with this. The best part about these sticker codes is that they are the brainchild of a now 9 year old boy, Holden, along with his brother and dad. Our students love to hear Holden’s story because, “If he can invent something, we can too!” Be sure to visit the Ozoeasy site and scroll down to read his story. Each child was given a paper with a rectangular black path, 4 code stickers, and markers. As stickers were placed, they were challenged to have their Ozobot follow the path, first in one direction, then the opposite way. What’s fun about the codes is that a different action is performed depending on which direction it travels. 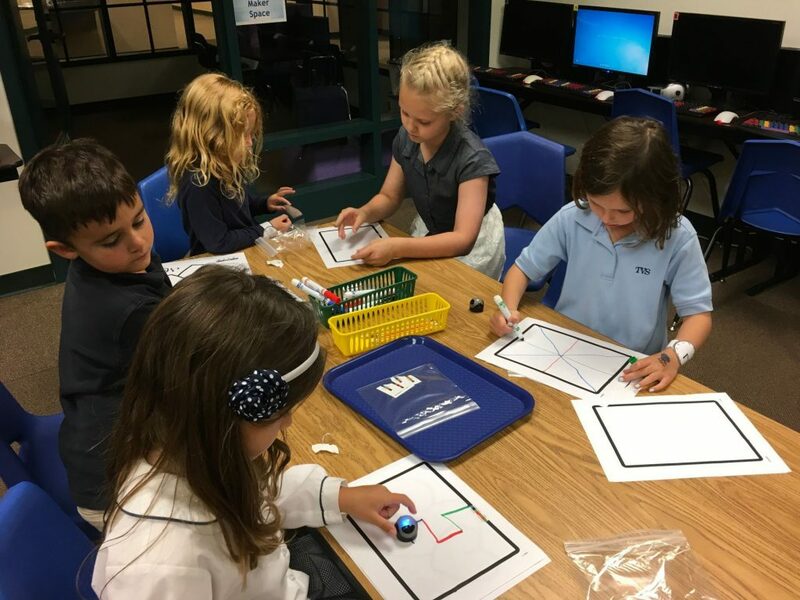 The students were also encouraged to draw paths inside the rectangle using red, green, and blue markers to see how the Ozobot reacted. Oh, my! What excitement! It’s SO much fun to see students engaged, experimenting, and working together. I’m sorry, parents; it’s my guess that there were a lot of kindergartners who went home that afternoon to ask for an Ozobot! In fact, on the way out, one boy whose mom teaches first grade at our school, excitedly shared with me that she would be coming down to talk to me about the Ozobots. And, she did! In the week since we’ve used the Ozobots, I’ve had several students ask me if first graders get to use Ozobots. They can’t wait till school starts again! Every year our Parents’ Club has either an auction or a gallery night to raise money for educational projects. Teachers generally submit an activity for bidding. I’ve been doing a “TechnoWizards Club” for the past few years. 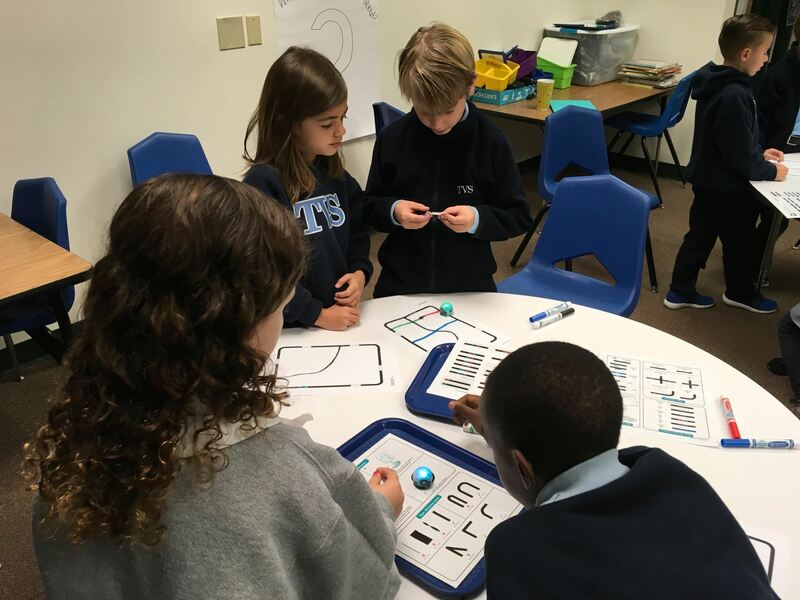 Last week, six students joined me as we worked with Ozobots, Ollie robots, and Little Bits magnetic circuits. We met for an 1 1/2 hours, which is never enough! Regardless, it was loads of fun to watch the children experiment with the different activities. 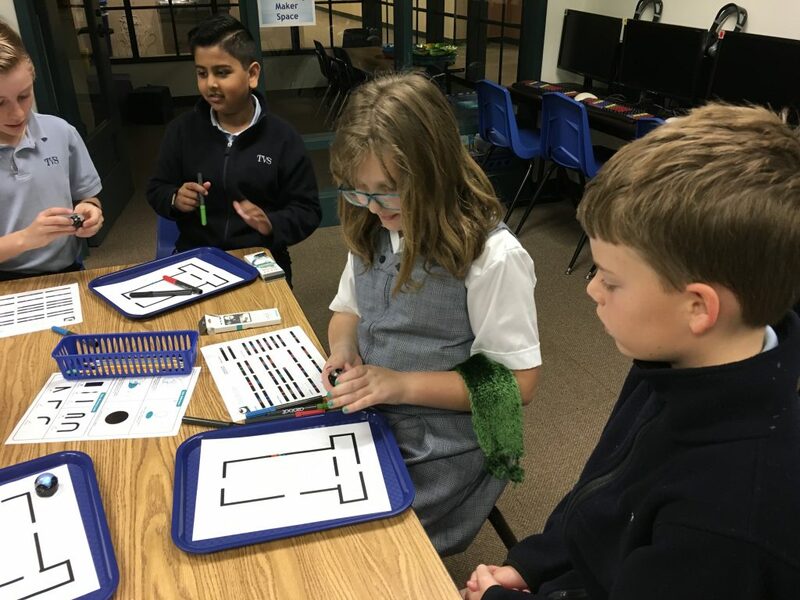 4th Grade Fun with Ozobots and Dr. Seuss! I’m not sure why but I hadn’t pulled out the Ozobots for the fourth graders this year so when they arrived at the lab and discovered Ozobots set out, they could hardly sit still to get instructions! Needless to say, I presented the instructions in record time! Their job – add color codes and paths to the outline of the Cat in the Hat’s hat. iPads were set out so students could video their Ozobots. A few did that and then air dropped video to me so that I could add to what I took. Here’s a glimpse at what happened. 4th, Seuss & Ozobots from Trinity Valley School on Vimeo. 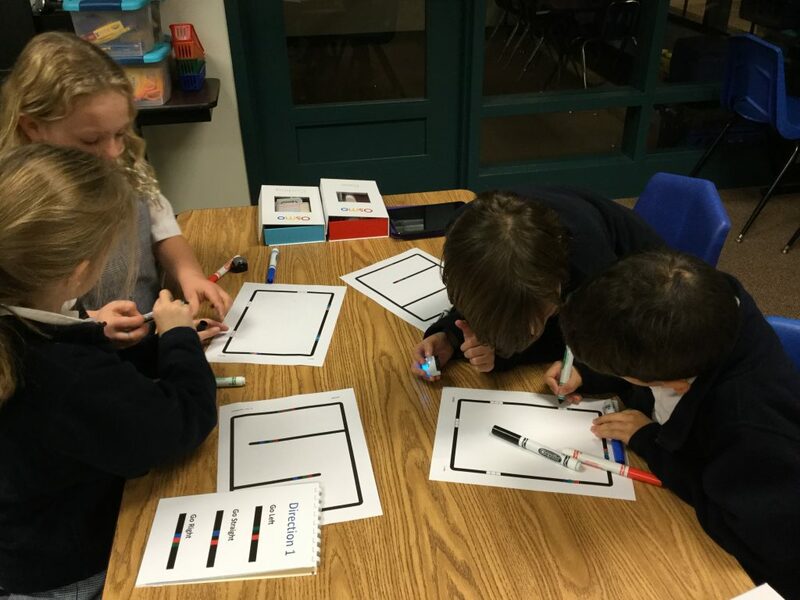 I would hear groans from students who couldn’t get their Ozobot to follow the code they thought they’d drawn. Then, I’d hear from someone else who announced that their code worked and they were more than happy to share tips on how to better draw effective codes. Lesson learned for me – I need to do MUCH more of the exploration time for the students. Yes, there are times when I need to do direct instruction but watching the fourth graders interact reminded me how important it is to allow time for uninterrupted learning to occur. 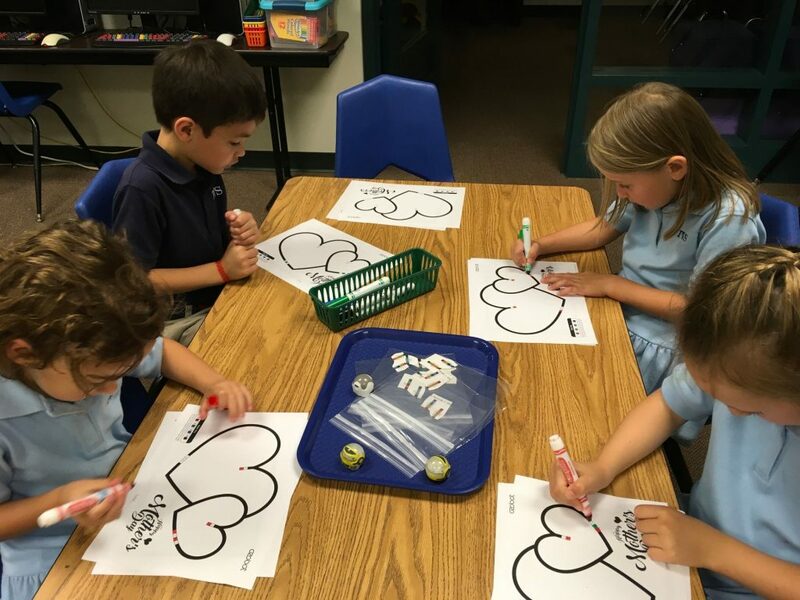 Ozobots Having Fun with Dr. Seuss! 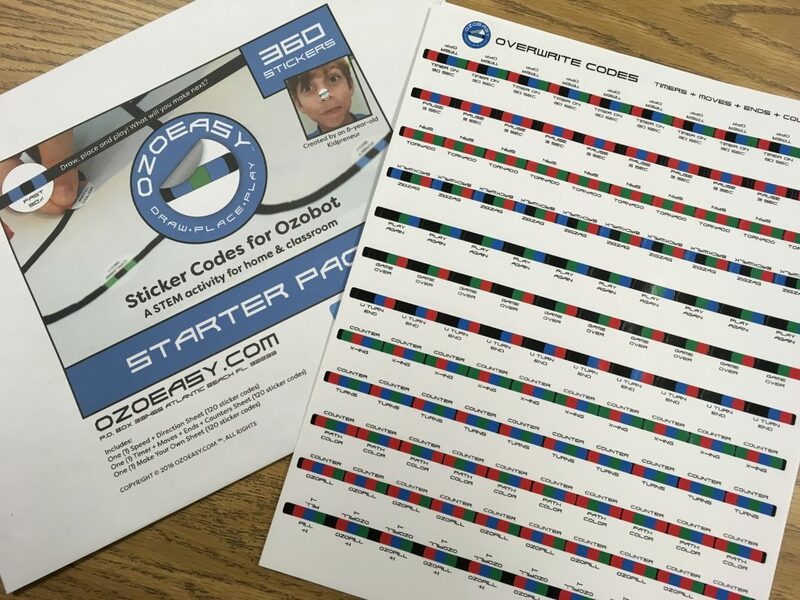 Ozobots, Ozoeasy sticker codes, and Dr. Seuss!! How much fun is that?? Ozobots are fantastic tiny robots that can be programmed by either drawing in a color code combination or by using the drag and drop Ozoblockly online program. I love these little robots because all ages can use them; they grow with the child. However, what we’ve discovered with the younger children is that it can be difficult to draw the codes “just right” so that the Ozobot can read them. That’s why I was thrilled to discover the Ozoeasy sticker codes this year. These small round stickers were created by an 8 year old – always fun to tell students that even young children can become an entrepreneur! Enter the Dr. Seuss theme! Using PowerPoint (Only because I wanted precise lines! ), I created a couple of “hats” to go with The Cat and the Hat. The first hat the children worked with had only one place to draw a connecting line – at the top. The students were asked to choose a color other than black to connect the lines. After demonstrating how the code stickers worked, we talked about best places to add those. For example, the codes have to have black lines on either side and they can’t be too close to a corner. Students were also encouraged to draw colored lines across the hat. After exploring the triangular hat, we moved onto the other template. This one had breaks in the black lines. 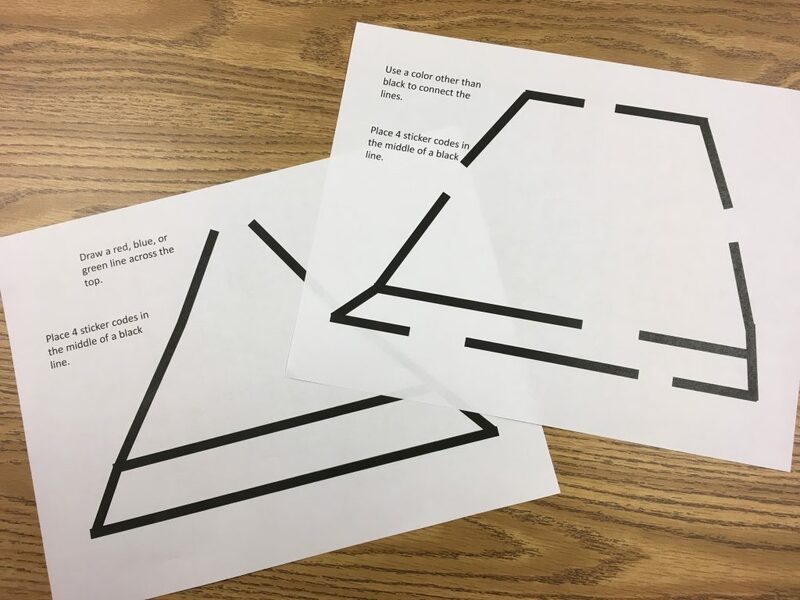 The children could draw their own code, place a code sticker on a line, or add a connecting line of a color other than black. What fun observing as the children discovered how the Ozobot reacted to the colored lines and the codes! As our time together drew to a close, we regrouped to talk about our observations. 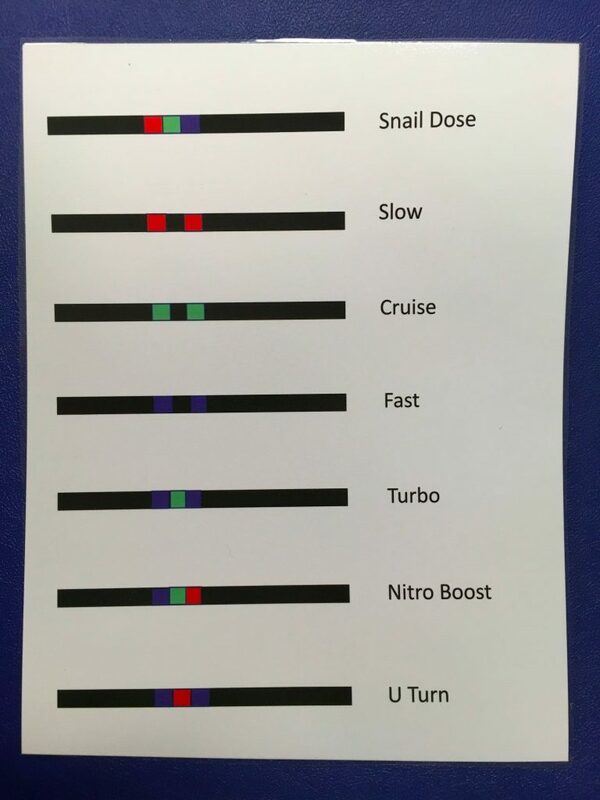 What happened when Ozobot rolled over a line that was a color other than black? 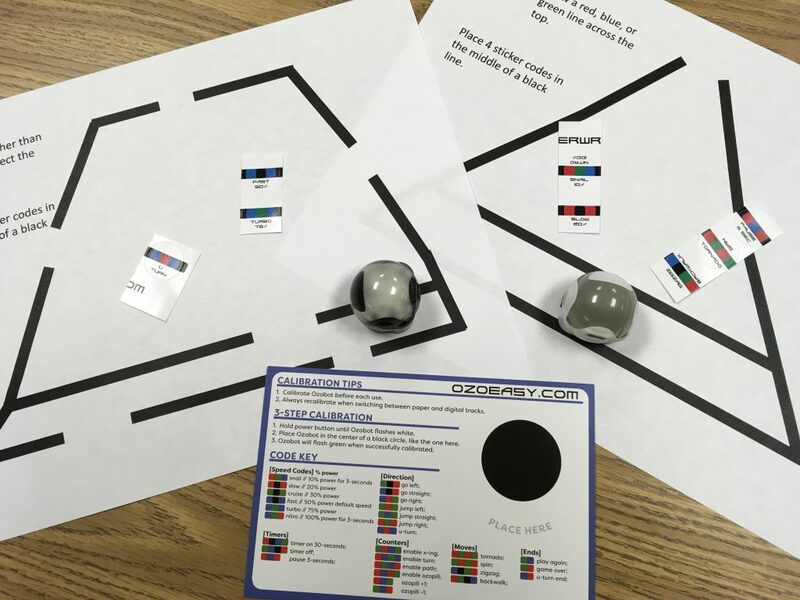 What did you discover about Ozobot moving in opposite directions as it traveled over a code sticker? What did you learn about drawing your own codes? Here are the templates of the hats. There are a couple of options included for each design. We work on age-appropriate coding activities throughout the year. 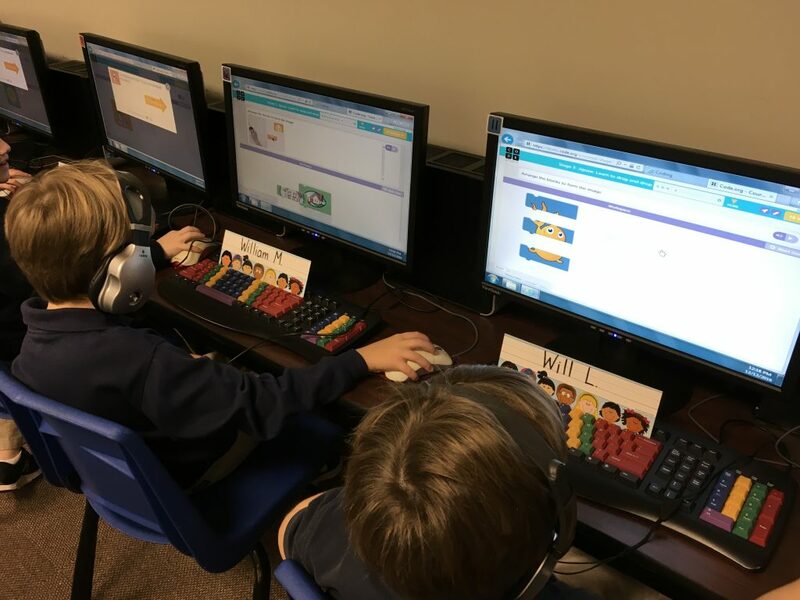 What I love about Hour of Code is that it’s an excellent way to bring in new and/or different ideas that the students and their teachers haven’t experienced before. 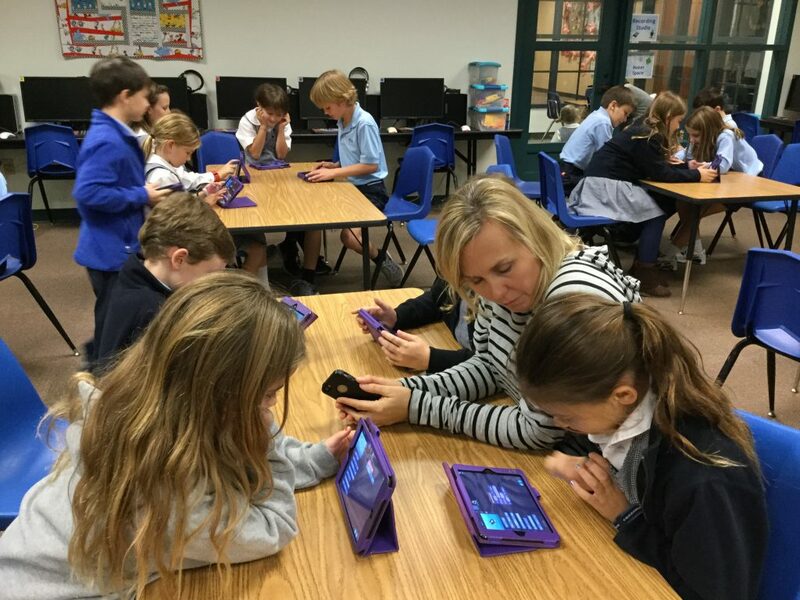 Unfortunately, Hour of Code always falls during the week our students are practicing for the annual Holiday Program. That means I have to get rather creative in scheduling times for classes to visit the lab. This year I tried something different – I set up a signup sheet using SignUpGenius. Since we have teachers with a large span of technology skills, I wasn’t sure what kind of response I’d get. It worked great! Out of 15 K-4 classes, all but 3 signed up for at least one 20 minute slot. Most signed up for two or more sessions! 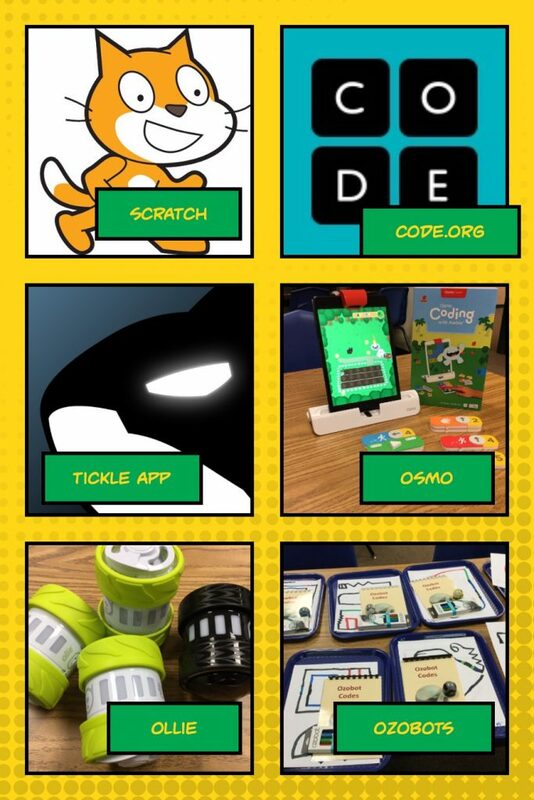 Thanks to fantastic Black Friday and Cyber Monday sales, I was thrilled to add 4 Ollie robots and 3 additional Osmo Coding games to the mix this year! 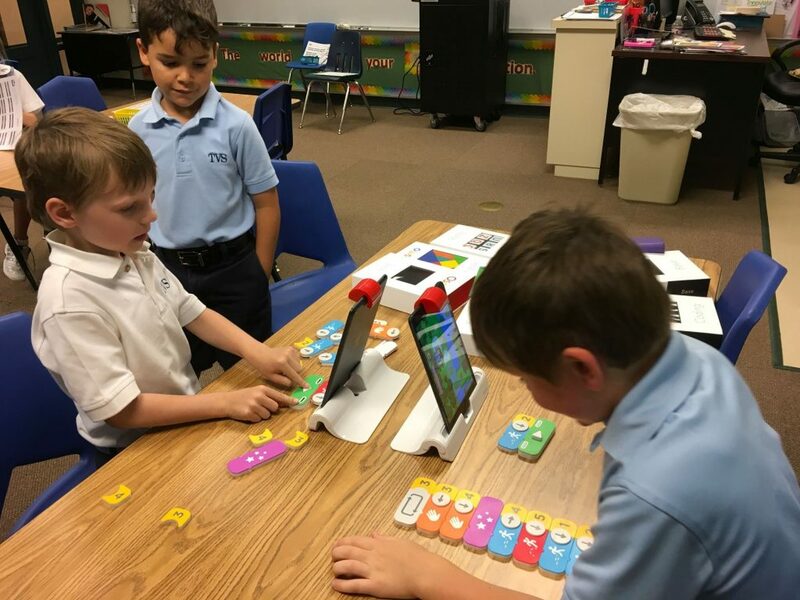 Osmo Coding – First and second grade classes started with this. Having only 5 Osmos, I was a bit concerned that students would have a hard time taking turns. No problem at all! I loved walking around, listening to the children talk through how to guide Awbie through mazes to eat strawberries! 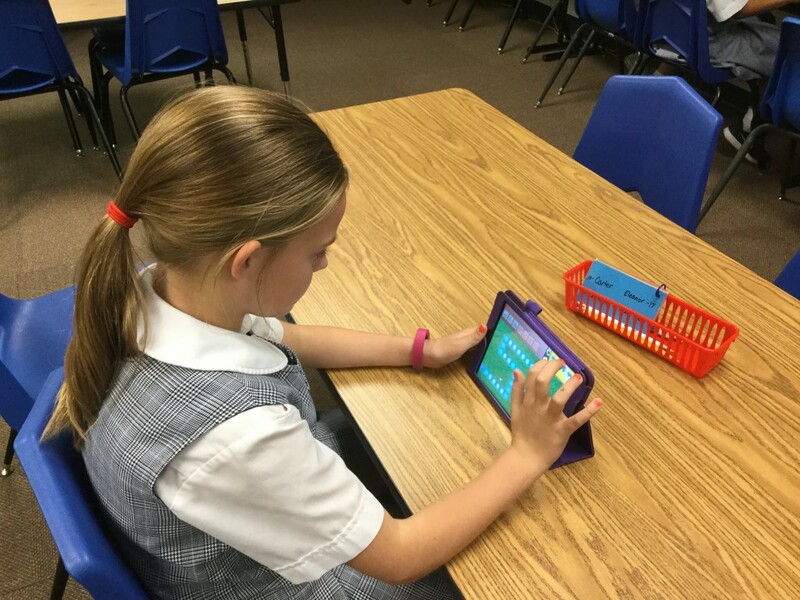 One of the best comments came from a teacher as she logged into SignUpGenius, “Okay, this is SO much fun. Can I please sign up for another time?” YES!! Exactly what I wanted to hear! 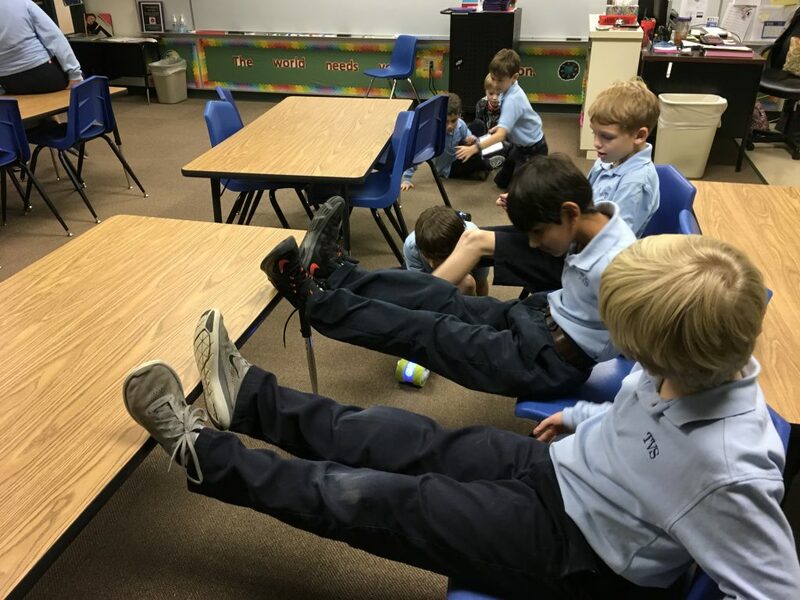 Tickle App – This is what I used for the third graders’ first lesson (hoping that their teachers would sign up for an additional time – they did!). Students used the time to explore how to make the Swimming Orca move in different directions, change looks, make sounds, etc. This was all in preparation for using this app to code Ollie’s movements. Looking back, I wish I’d ordered Sphero or SPRK+ because they move slower and that makes them easier to control. Ollie is FAST! Unfortunately, the other two were too expensive for my budget – another time! I did put a speed limit on Ollie of 50%. Most groups actually found that a 30% or slower speed worked even better. That was certainly better than having 4 Ollies zooming around the room running into walls, chairs, tables, and people! It wasn’t quiet but there was much problem-solving occurring as students tested, adjusted, and retested to make Ollie go completely around a table. 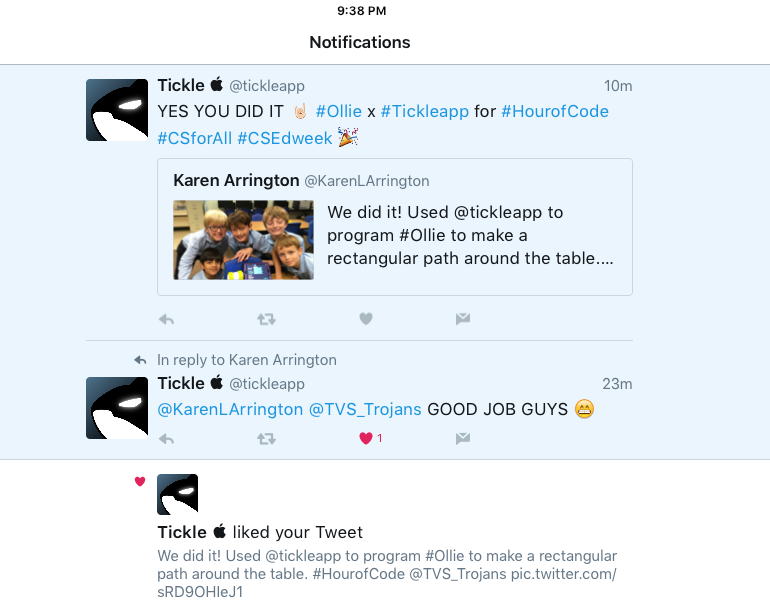 The group above was thrilled to receive a response from the Tickle app creators regarding their success with getting Ollie all the way around the table! 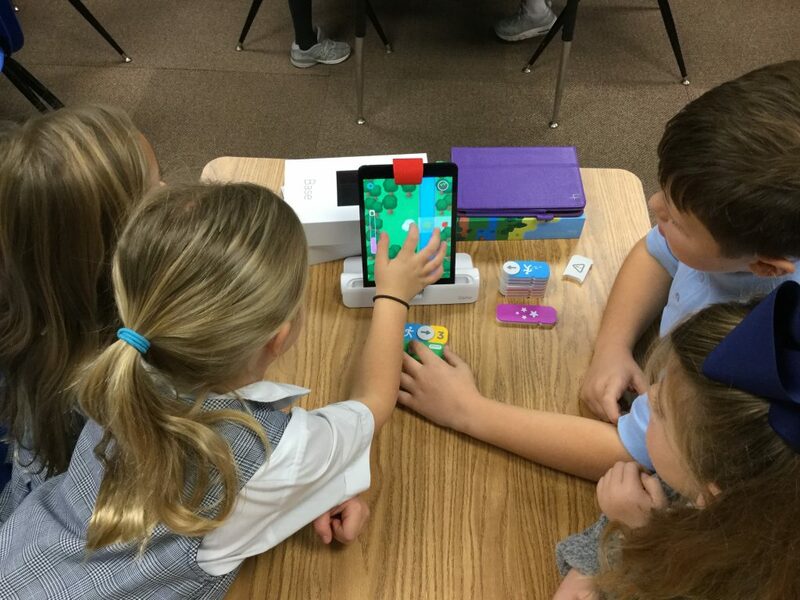 Ozobots – A first grade class came to the lab, ready to do Osmo coding. Wouldn’t you know it? 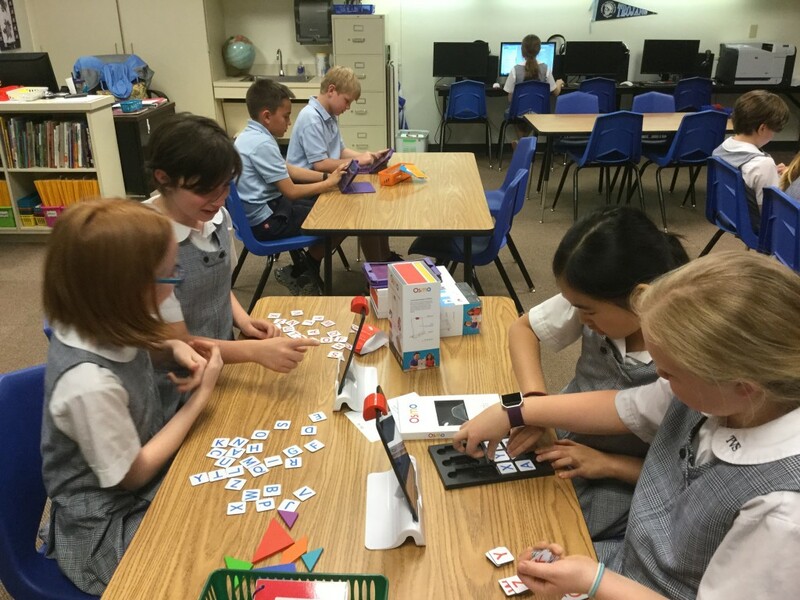 The internet went down as soon as the students tried to get onto Osmo! The Ozobots were quickly pulled out as I explained how they worked. I’d already made copies of Ozobot Basic Training 1 so we were ready to go! 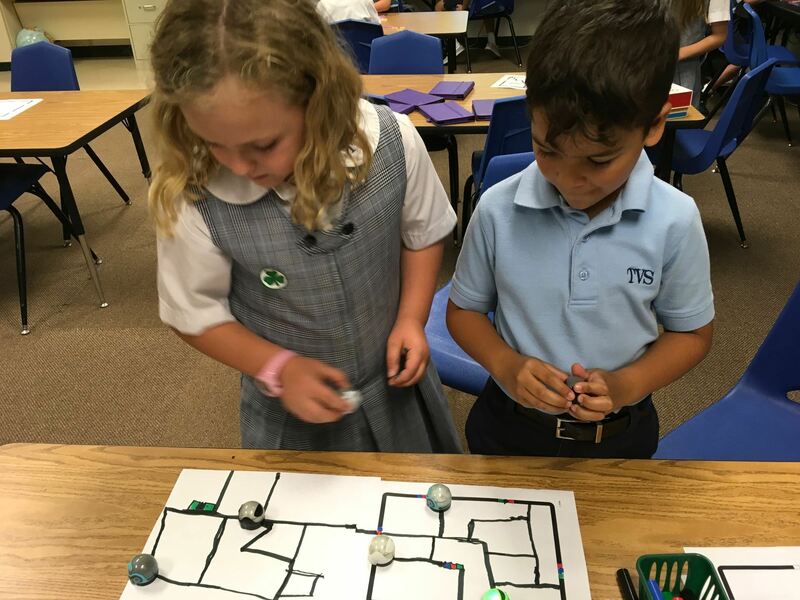 For a quick switch in plans, the little ones did great and quickly learned how to combine color combinations to program their Ozobot. 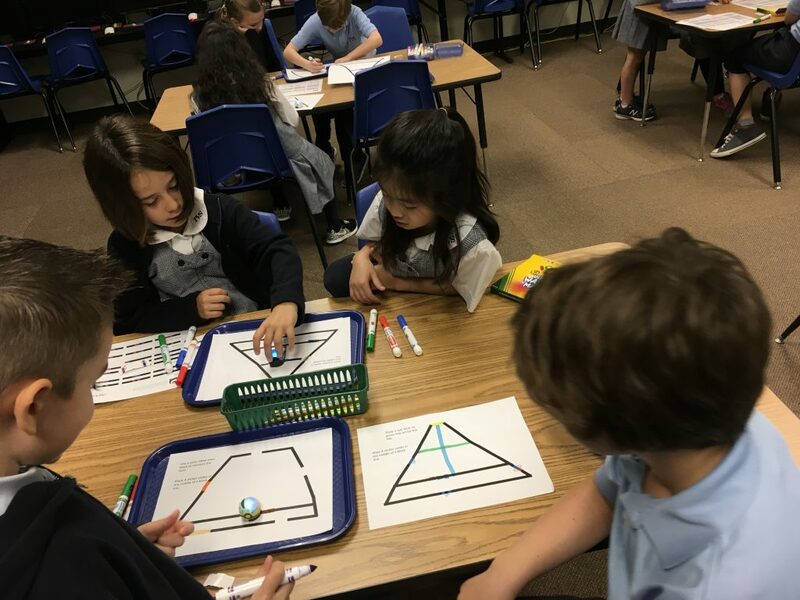 A third grade class, returning for their third time, worked with Ozobot Basic Training 2 where they learned how to control Ozobot with directional commands. 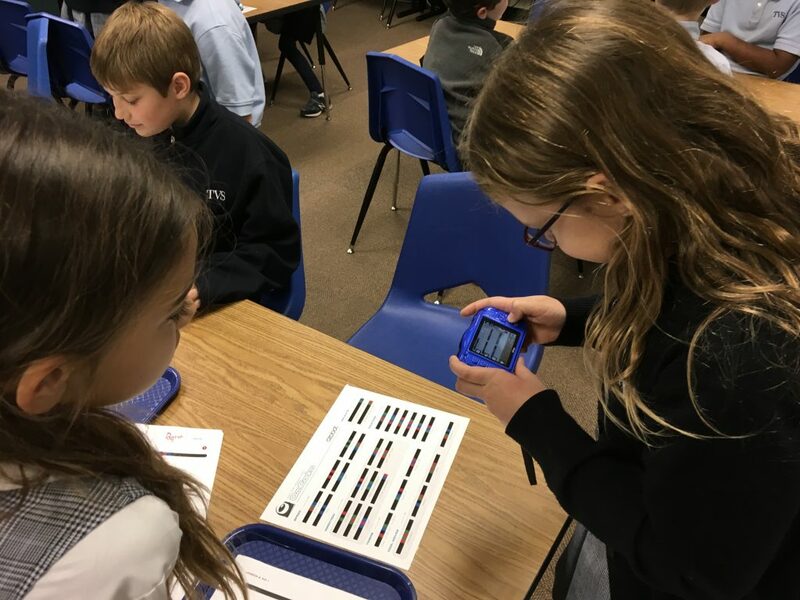 I love this photo of the girl taking a picture of the Ozobot codes so that she and her friend could continue working on the challenge at home! 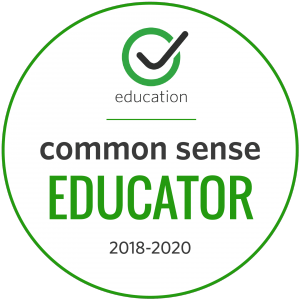 Code.org – I love this site; such a helpful curriculum for all ages! I have all K-4 students signed up in Code Studio so that I can keep track of their progress. 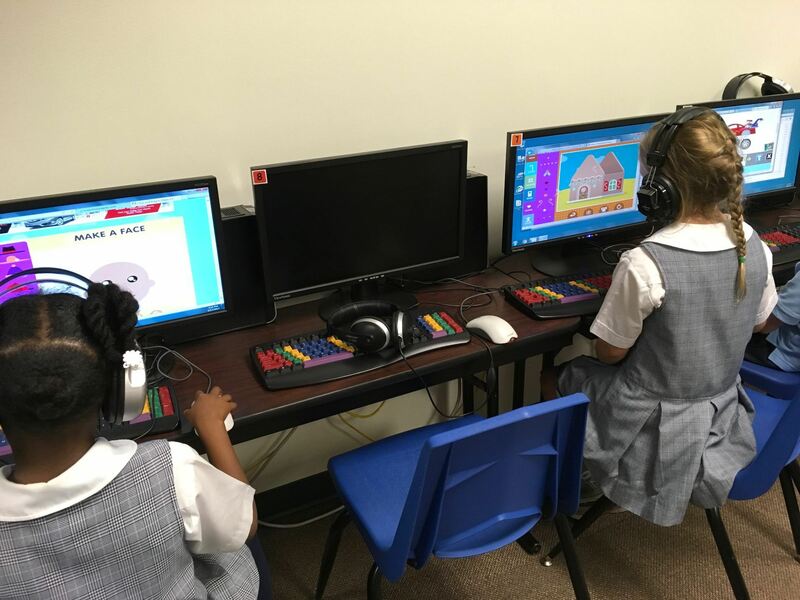 For younger students, we stayed with Code Studio; starting with an off-line activity where students were introduced to vocabulary and then moved figures from one block to another using the white board. 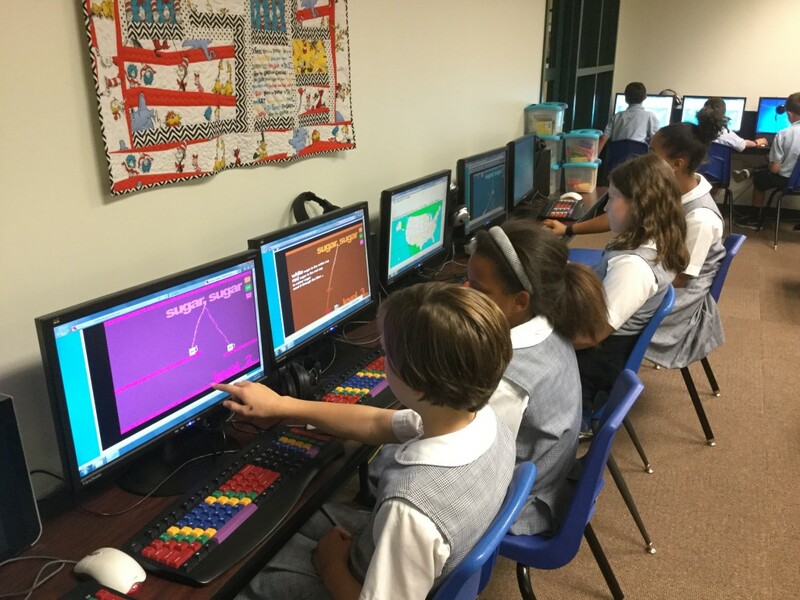 Older students had their choice of some of Code.org’s activities specifically designed for Hour of Code. 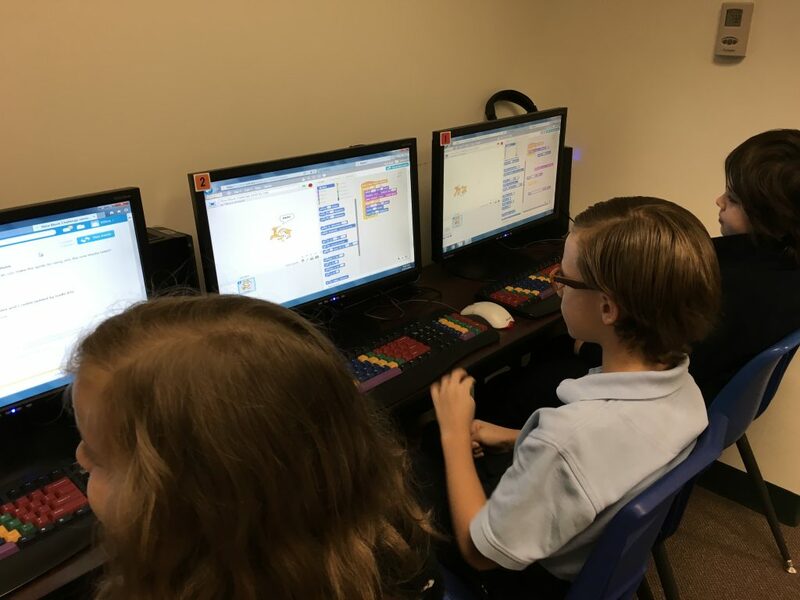 Scratch Programming – Fourth graders were set up in Scratch and presented with a Nine Block Challenge. 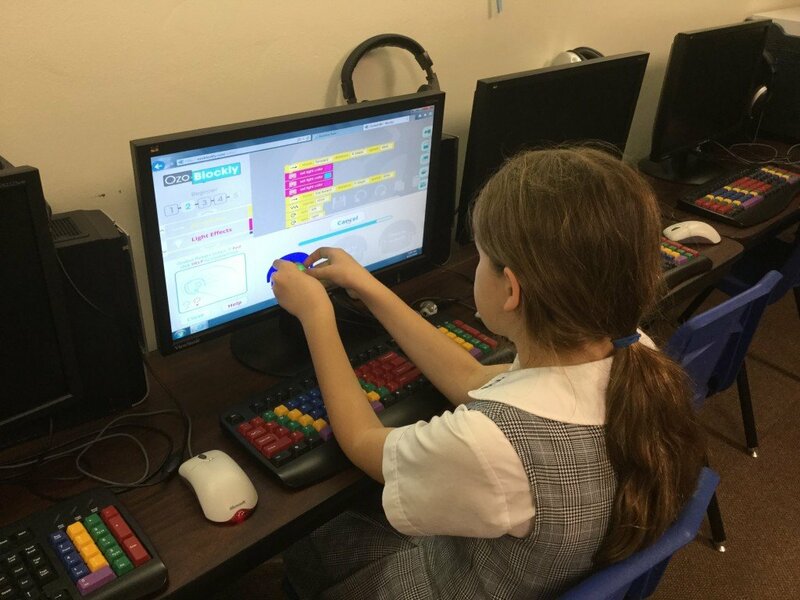 Although some of the students use Scratch at home, we hadn’t done anything with it at school. Basically, this lesson was designed to expose students to the program and allow them time to experiment with a few blocks at a time. This is not the end of our coding experiences; just the beginning. It was rewarding to watch the excitement exhibited by students as they worked through challenges. Was it easy? No!! And, we discussed how people who create programs for the computer rarely “get it right” the very first time. Failing, not getting it is JUST FINE! We still learn from what doesn’t work! 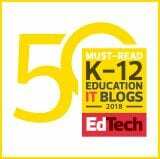 That’s the power of coding/computational thinking activities! 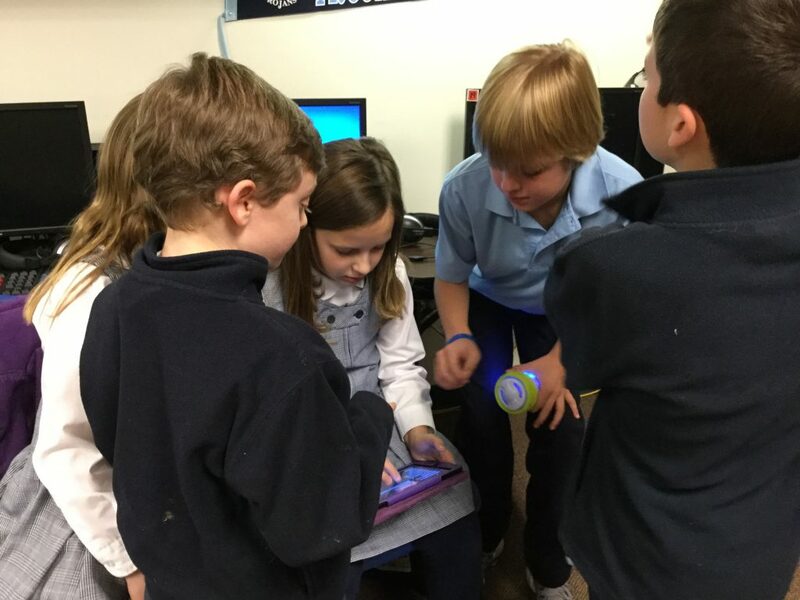 4th Graders + 1st Graders + Ozobots = Great Learning! A couple of weeks ago, I purchased 8 Ozobots. Ozobots are small robots that can be “programmed” by using a series of color combinations (OzoCodes) drawn by markers on white paper. These were introduced to a 4th grade class that just happened to have some skilled Ozobot users! After watching a couple of the students, I decided to ask their teacher if they could share their knowledge with a first grade class who happened to also have some college student observers from TCU. The fourth graders arrived before class started. They had spent their weekend drawing Ozobot paths to share with the younger ones! What leaders these older students are! Our four young teachers were amazing! They all walked around providing tips and offering any guidance needed to make sure the little ones (and the college students) were successful at drawing codes for the Ozobots. And, as the older students left, I was asked, “Can we come back next week and teach?” We will definitely have to make that happen!